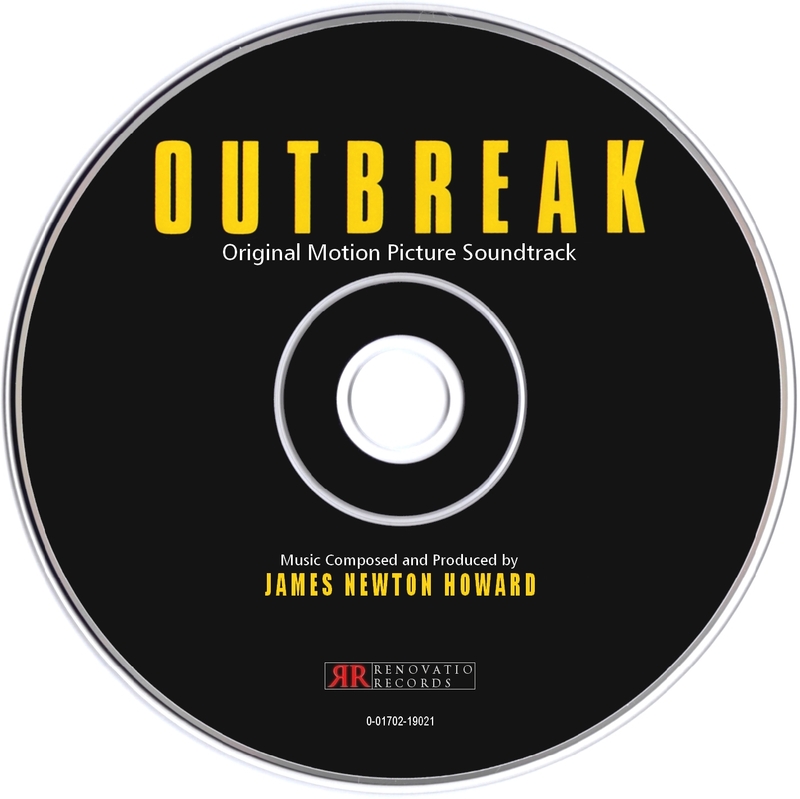 Renovatio Records presents the score for Outbreak, composed by the great James Newton Howard in 1995. 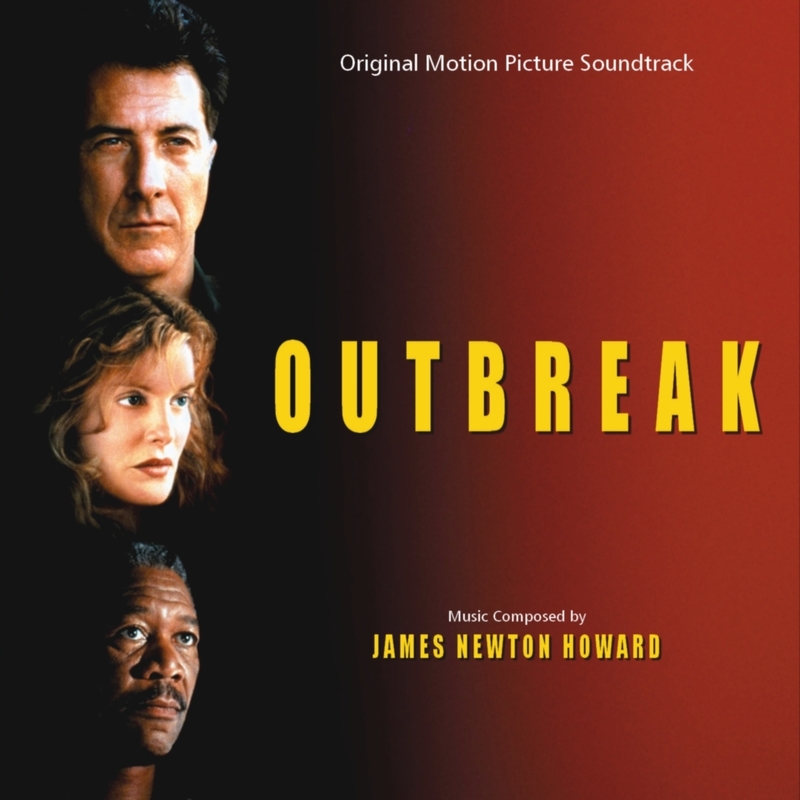 The film, directed by Wolfgang Petersen and starring Dustin Hoffman, Rene Russo, Morgan Freeman, Cuba Gooding, Jr., Patrick Dempsey, Donald Sutherland and Kevin Spacey, involves an outbreak of a fictional deadly virus called Motaba that originates in Zaire and finds its way in the form of a smuggled monkey to Cedar Creek, a small town deep in the United States. 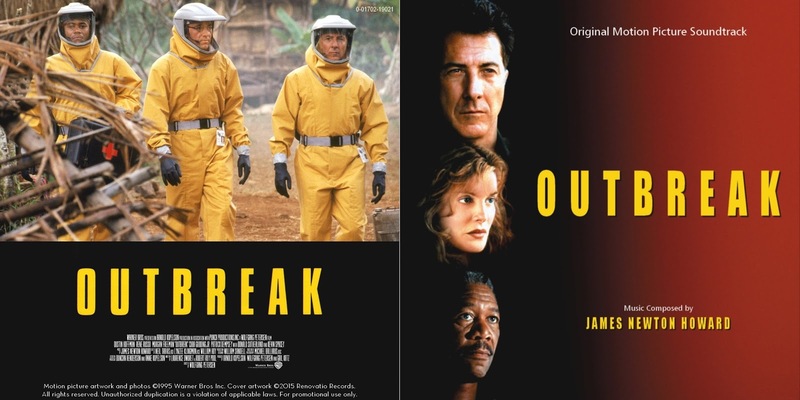 The plot focuses on the efforts of a group of doctors (led by Hoffman) in trying to find a cure to the disease, while the military is willing to go as far as necessary in order to contain the spread of a deadly contagion. The film score landed on James Newton Howard, who had already proved to be able to provide music for action thrillers, having scored The Fugitive two years earlier. For Outbreak, Howard merged a robust symphonic ensemble along with performances by African vocalist Lebo M., synthesized sequences, and the L.A. Master Chorale, resulting in a enjoyable and interesting score, highlighted by its instrumental creativity and thematic progression. 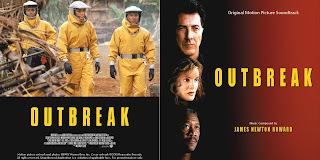 In Outbreak, you'll hear a tender and hopeful passage for the two main characters' love arc, cool and eerie suspense cues, African percussion backed by robust brass and choral overlays, frenetic action sequences and dissonant crescendos in which strings whine resembling the cries of monkeys. 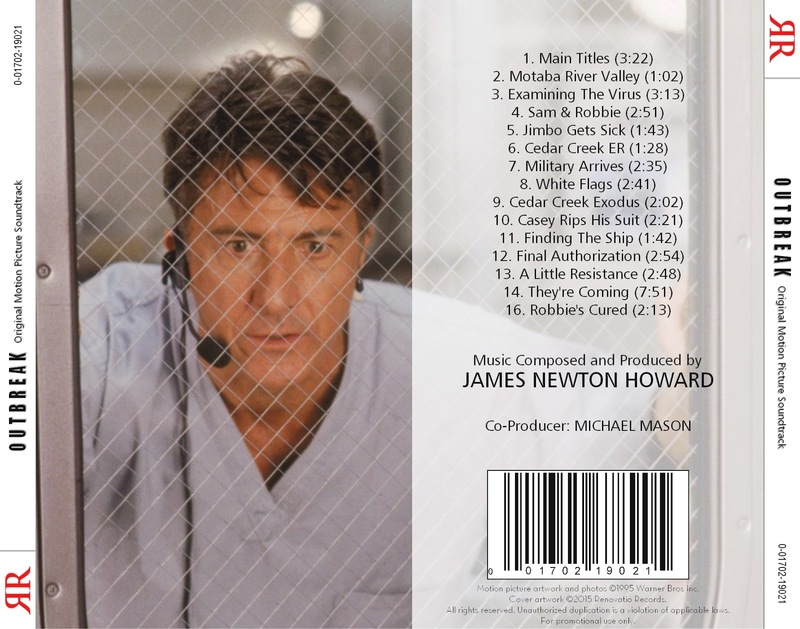 Furthermore, Howard manages to provide a solid main theme which he adapts to different scene requirements, as well as a frightening motif for the virus itself. And that's not all! Howard also introduces a magnificent yet heart-breaking choral performance in "Casey Rips His Suit" that will make you shiver! The score was issued twice by Varèse Sarabande. First, in the form of a rather short 1995 album containing a few of the best moments of Howard's work, but also lacking many others, and later, in 2015, as a Deluxe Edition, containing the complete score along with alternate tracks. 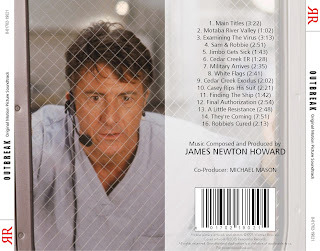 Though this edition was better received than the regular release, it contains several cues that act as a filler; this results in a lengthy 2 CD album that fails in providing an enjoyable and fluent listening experience. 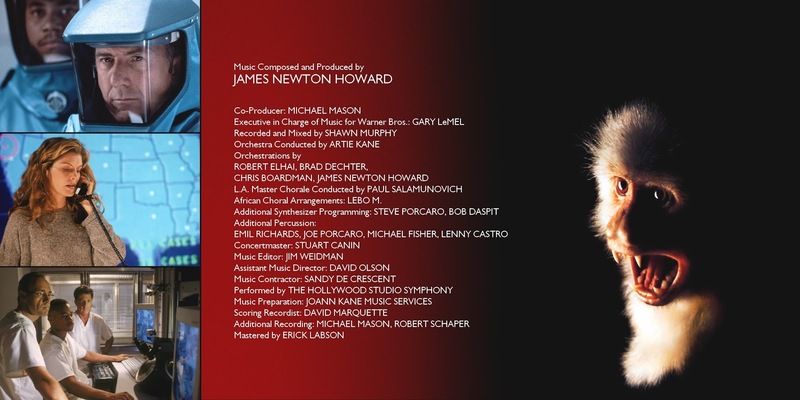 Renovatio Records proudly presents a new edition of the score, with the best highlights of the score and improved sound, in an effort to offer the listener one of the most influential scores James Newton Howard has written in the 90s. Excelente filme. A epidemia de ebola, entre outras que ocorrem na África nos mostram que é um filme bem próximo da realidade.